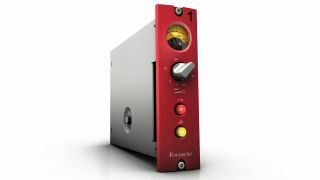 NAMM 2013: Alongside two recent additions to its Scarlett range of audio interfaces - the 18i20 interface today, and Scarlett Studio bundle earlier this week - Focusrite has unveiled the revival of its classic Red Series 'lunchbox' style mic preamps. The Red 1 500 Series Mic Pre will be made in the UK, and feature the same input and output transformers as the original Red 1 and Red 8 pre amps of the mid-'90s. For full details, check out the press release below. The Red 1 500 Series is set to for release this April, with an RRP of £799/$1249. Focusrite has announced the return of the legendary Red Series mic preamp with the introduction of the Red 1 500 Series Mic Pre, a module for the popular 'Lunchbox' format. As with the original Red range, this new module will also be 'Made in England'. Focusrite's Red Range gained legendary status following its release in 1992. The Red mic preamps rapidly became sought-after in the world's top studios, with their unique signature sound and ability to perform faultlessly on a wide range of instruments with almost any microphone. Classic Red circuit topology & components: A mono mic preamp that uses the same circuit design and components as the original Red mic pre - the Red 1. 500-series 'Lunchbox' format: For the first time, a Focusrite product is available in this popular portable format. Original input & output transformers: Features the same Lundahl LL1538 input transformer and custom Carnhill output transformer as the original Focusrite Red 1 and Red 8 microphone preamps. The use of these very high quality transformers gives the Red Series its transparent and expensive-sounding character. Grayhill gold-plated military-grade gain switch: The switched gain structure of the Red 1 500 Series Mic Pre means you can accurately recall preamp settings and, with a solid, super-reliable, gold-plated selector switch, you know you'll get repeatable results. Suitable for virtually any microphone: With a gain range of 66dB and a carefully-chosen input impedance, the Red 1 500 Series Mic Pre is perfect for almost any microphone, be it ribbon, dynamic or condenser. Backlit VU meter with switchable calibration: The built-in VU meter helps gain accurate results, with calibration to ensure your levels are always spot-on. Featuring the same circuit topology and components, the Red 1 500 Series Mic Pre offers the breathtaking performance of the original Focusrite Red microphone preamplifier in the popular 500-series format. With a Lundahl LL1538 input transformer, and a custom Carnhill output transformer, just as in the original design, the Red 1 500 Series Mic Pre is perfect for those who wish to bring the signature sound of the original Focusrite Red range into the modern studio. It's even got the signature red anodised aluminium front panel, a focal point fixture in studios around the globe. The Red 1 500 Series Mic Pre has switchable phantom power, polarity invert, and an easy-to-read illuminated VU meter, making it the perfect preamp choice for a 500-series rack in the studio or on location. Its stepped gain structure (with a Grayhill gold-plated military-grade switch) in 6dB steps from -6 to +60dB, provides accurate, precise channel matching and recall. The output stage of the Red 1 500 Series Mic Pre will easily drive long cable runs without significant loss of quality, making it ideal for remote recordings. Focusrite's unique mic preamp topology provides superb common-mode rejection, excellent overload margin and, with its shared gain structure (20dB from the transformer and up to 40dB from the amplifier), a very low noise floor combined with the signature extra-wide bandwidth (10Hz to 140kHz). This exceptional level of performance is maintained over a wide range of impedances applied to the input, making the Red 1 500 Series Mic Pre perform flawlessly with almost any microphone: ribbon, dynamic or condenser.